Diception� is a fast paced, fun for the whole family, board game that keeps you guessing who is telling the truth and who is really bluffing! Fast paced, challenging and portable; what more could you ask for? Before you buy a product, it's generally common practice to be familiar with what it does, the branding, and other details. We feel that the same rule applies to our "New Inductees" we announce each week, so this section is titled "About Our New Inductee." The information in this section will provide you with a quick yet accurate glance of what the product or service is all about. "Life Can Be But A Game Of Diception�"
"There is so much deception in the world of business and personal experience yet life can be but a game of Diception�. The fast paced activity, thrill of the challenge, and the convenience gained from the portability of this game can make any experience one of joy, levity and progressive gain!" Are you ready for a game of strategy and laughs that never seems to be the same with every single game?� Well then, Diception is the kind of game you are looking for! Diception� is a game of such simplicity that takes less than two minutes to learn!� The trick to the game is trying to master the darned thing.� That I can assure you is no easy task to accomplish due to the fact of how each game can be an entirely new direction than the one prior.� Be forewarned though, when a game you are playing seems so similar to one played prior, that is a trap that assures your defeat for that game should you try to take strategies used before. Playing Diception requires no special skills or abilities at all.� Even a complete idiot can play the game yet there is the one factor to take into consideration that you never can tell who is bluffing!� To put the cherry on the icing, calling what you might perceive as a bluff by an opponent may very well be the real thing, capturing you by surprise. Think you have got the game figured out already? Well, there's plenty more to excite your senses but you can't discover what it is all about until you move to the next section, so what are you waiting for?� Move to the next section! "The game is instrumental in initiating ever-changing strategy development and use of higher level cognitive skills for each of the players." - Doctor of Advanced Behavioral Study, Ph.D. M.S., E.D. At this point we have already done all the pitch and spin to provide a simple intro about Outside The Box.� Now we will focus on the game play itself. Before you jump to any assumptions, no, we are not implying that you are a dummy. Keep it simple is the idea here to give you a simple outline of how Outside The Box is played. 2 teams of 2 or more players�per team are chosen.� Sorry folks, there is not a single player option. Both teams receive a plastic pawn, 12 Pass Cards, 26 scoring pieces, and 4 Quick Reference rule cards. All decks of cards are shuffled and the digital timer is placed in view of all players. The "Start" square is placed next to the Phase 1 Category card and the pawns are put on the "Start" square. The Speed Round and Alphabet Letter cards are placed near the game board. 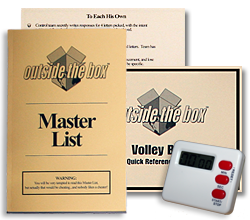 The Master List Book should be available for quick access and everyone should have a pen or pencil and paper. In each round of play, answers are given in order, A to Z.� After you have played each round of play, you use the "quick reference cards" for any questions about the rules or scoring. As you progress through the round of play, you advance through 3 phases.� With each successive phase, the categories become more challenging. To win the round of play, you leave Phase 3, flip over the "Start" square, and attempt your "Final Challenge." * Be sure to note that not all of the rounds of play are using the A to Z order of play. You don't need to learn all of the rules right out the gate.� The game is designed for you to learn as you progress through each round of play. You are playing on a TEAM!�Your team player(s) can help you and YOU can help THEM to play and WIN. 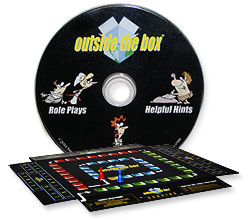 In our evaluation of Outside The Box, we established an average of 56 minutes to 1.26 hours, pending upon time of day and interactive skills/personalities of the players.� This obviously can change based upon the combination and number of� persons playing the game. In every evaluation study we performed, the players always chose to play a minimum completion of all rounds at least twice. Outside The Box is a gutsy new approach to board game design creating its own new path, yet it still manages to defy the odds and draw plenty its share of attention all the same. "Diception� is the most powerful tool in the arsenal of an opponent.� This game uses the principle laws of deception to cause a player to draw upon their creative intellectual skills to develop innovative new strategies.� This results in an extensive stimulation to skill development which until that moment may have remained in a dormant state." 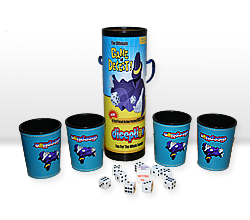 "Diception� adopts the use of an 'unknown element' to stimulate active response in the game play. The 'unknown element' serves as a catalyst that is introduced repeatedly to perpetuate the stimulation which generates the active response.�This ensures a dynamic rate of skill development." "There is no question remaining as to the effectiveness and functionality of Diception� as well contributory value from the use of the game whether in singular or repetitive event." * PLEASE NOTE: At the request of our independent evaluators their names are not disclosed to protect their personal and professional privacy. Their labors are provided at no charge to assist us in providing a well-balanced and accurate product or service evaluation summary. All opinions and or statements from the independent evaluator(s) featured here do not represent the opinion of The Toy Man� Product Guide, any member, division of, or Epiphany Communications itself. Diception� was available for consumers at the Anaheim Hilton� and Disneyland� along with a variety of other products for consumer hands-on evaluation. To spice the experience up, The Toy Man and his staff gave away over 1,000 products at Disneyland including several copies of Diception�! The excitement for our consumer hands-on evaluation participants seemed endless as we all had the enjoyable experience of watching guests of the Disneyland resort going bonkers playing Diception�. 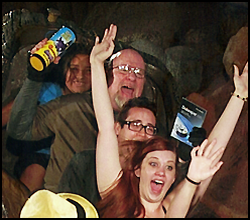 For some it was while waiting for family members to come off of a ride while for many, it was actually playing the game with others while in the line waiting to get on a ride!� Splash Mountain was a perfect example as you can see from the image above-left.� For everyone this was the experience of a lifetime, even for our staff! It was so amusing to see people getting so anxiously excited as they played Diception�, knowing that at any moment it would be time for them to jump on the ride!� In one instance, the people playing the game told the persons behind them to go ahead of them so they could finish the game! Bluffing and guessing, howls and screams, that's what their playing Diception� was all about. In reading our feedback forms and watching our videos from the consumer evaluation, it was all too obvious that Diception� held many people captive with the challenge and fun which made the game a success in this segment of our evaluation. Diception� passed this segment of our evaluation with the highest of recommendation. The rating of a product is useless if you do not fully understand and comprehend how the ratings is reached or what the value of the rating represents. This need for clarity encouraged us to have this section titled "A Sampling Of Our Evaluation Category Ratings." To assist you in gaining a greater understanding of the evaluation category ratings we use, a small sampling of the individual category titles & rating scores from the complete product review itself for this product or service are featured here. The categories which have been selected to be featured in this evaluation report summary for public view, specify some of the primary points of how and why each specific rating score was reached. Diception� gave a good run on this ride for evaluation of CREATIVE AGENDA. The creative agenda of the game is exceptional, being applicable for hybrid use. The creative agenda of the game delivers a guarantee of a strong narrative progression and prompt response level like no other.� It creates an incredibly strong influence in cognitive development creative strategy thinking. The players have to think quick and get creative with every single game. No time to sit there and look stupid. Diception� provides a challenge that causes an addictive effect. Players always wanted to go for at least two-three games in our testing. 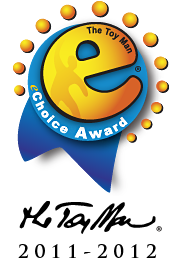 Diception� pulled a perfect score of  Stars in this evaluation category for CREATIVE AGENDA. funQuotient� is an another evaluation category where Diception� showed its unique characteristics that make it so much fun to play. Diception� is a game that not only is good for home fun but puts the funQuotient� back into the educational facilities where to many kids, it seems there was none before. 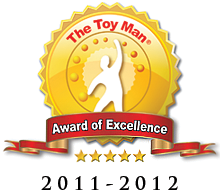 Diception� manages to maintain an equal and solid balance with skill development and improvement of social skills. 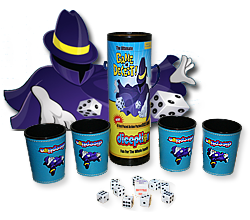 Diception� has all of the right elements to create the strongest level of funQuotient�. The literally endless number of narratives which could be developed to win this game, serve as a catalyst to create plenty of competitive challenge.� Diception� pulled its weight well and came in strong with a perfect score of  Stars in this evaluation category for funQuotient�. Learning curve? With Diception� the LEARNING CURVE was simple and short. A little reading and off you go, deciding whether you will try and pull a bluff or let it all hang out as is.� Having a game designed with a short learning curve adds greater value to the game. It creates a stronger inspiration for players to strive even harder to develop their creative expression skills to win the game. This also enables Diception� to keep from becoming boring and redundant. Diception� comes racing across the finish line with a perfect score of  Stars in this category for LEARNING CURVE. Diception� clearly was working the valuable attributes in MARKETABILITY. It contains all of the primary elements we need to consider in the marketability of a product. Diception� appeals to a vast range of age groups as well as being a hybrid product. Diception� is a game that sells itself. Once a consumer get their first experience with Diception� , they will not only play the game again but will share their the delight of their experience with others again and again. The portable tube that that holds all of the game components alone adds a very strong level of scoring for marketability. Although Diception� pulled through this rest of the evaluation categories so well, the visual appeal and a few other evaluation categories were held scores just a 1/2 of a point short of a perfect score.� Diception� comes through in this evaluation category falling short of a perfect score by just a half a point!� The final rating score for Diception� was [4.5] Stars in this category for MARKETABILITY. Diception� possesses all of the right elements to create a progressive rate of skill development and improvement for players of all ages. One of our independent evaluators said it so well. It is more than obvious to see that Diception� makes a substantial contribution to skill development in this evaluation category. Diception� rocks the house yet again with a final score of  Stars in this category for SKILL IMPROVEMENT. VISUAL APPEAL posed a very strong challenge for us in our evaluation. The cylindrical shape of the game box is stimulating to the eyes and draws your eyes to follow the entire perimeter of it.�The game is simple, no spectacular splash of imagery yet the simple and bright colors with very visible text draws the attention of everyone so well. At the same time, there is a minute downside.�Looking at certain common angles, an illusion of distortion in the imagery occurs.� This caused Diception� to docked a 1/2 a point in this evaluation category.� Diception� came in with a powerful score rating of [4.5] Stars in this category for VISUAL APPEAL.